WESTMUSA is an expert tax and accounting firm serving companies and individuals from the Nordic countries and beyond. With deep understanding of both Nordic and US tax law, Westmusa prepares fully compliant US tax returns that minimize your tax bill and provides expert advice on US-Nordic tax related questions. Westmusa is based in New York City. Providing exceptional tax and accounting services in the US to companies and individuals from the Nordic countries and beyond since 1993. 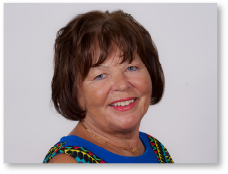 Led by president Ann-Christine Westerlund, a leading international tax advisor with over 30 years of experience serving Nordic/related organizations and individuals. Deep understanding of both Nordic and US tax regulations, for fully compliant US tax returns that minimize your tax bill. 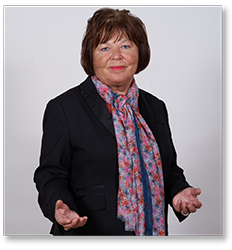 President Ann-Christine Westerlund is fluent in English, Swedish and Finnish, for easy, accurate and fast communication. Personal attention and customized service packages that reflect your unique personal or organizational situation. Accounting Manager Victor Westerlund is based in Raseborg, Finland, with frequent visits to Westmusa’s New York City headquarters. provides best practice-based tax and accounting services for companies and individuals from the Nordic countries and beyond. Our services include preparation of corporate and personal tax returns that are fully compliant with US tax laws and minimize your tax bill. Every accounting and tax situation is different. 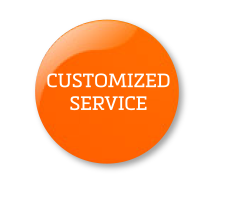 That’s why every Westmusa service package is customized. New laws that can make your out-of-state sales taxable! For a taxing jurisdiction to require an out-of-state company to collect and remit sales tax, the company must have some kind of connection with the taxing jurisdiction (state). This connection we call “Nexus”. When it comes to sales tax, the most common nexus principle requires the out-of-state company to have some physical connection with the state to make their sales taxable. CLICK HERE for more, and for additional updates. that comes with knowing your US tax return and ongoing accounting needs are expertly handled. That’s what Westmusa has provided to Nordic corporate and individual clients since its founding in 1993 by leading international tax advisor Ann-Christine Westerlund and her husband, M.E. Mousa. With our unique understanding of both US and Nordic tax regulations, Westmusa provides customized accounting and tax preparation, including fully compliant US tax returns that save you money. President Ann-Christine Westerlund is fluent in English, Swedish and Finnish – for easy, accurate and fast communication. 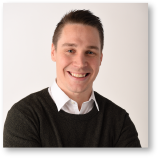 Accounting Manager Victor Westerlund, based in Raseborg, Finland, adds Nordic presence. to your needs and objectives, and carefully review your current and recent accounting statements and tax returns. our expertise to your specific accounting and tax situation and recommend the customized service package just right for you. a fully compliant US tax return that reflects our deep understanding of both US and Nordic tax regulations and saves you money. as your expert tax and accounting services partner, to ensure your accounting and tax reporting are cost-efficient and compliant. It started with Stevie Wonder. The global superstar performed in Finland in 1984, and Ann-Christine Westerlund of Ernst & Young Helsinki was assigned to determine whether Mr. Wonder was obliged to pay taxes in Finland. Ann-Christine studied the US-Finland tax treaty and found it interesting – so much so that she decided to specialize in US-Nordic taxes during a stellar 14-year career at Ernst & Young that saw her rise to Partner in 1986. In 1990 Ann-Christine moved to the US and founded the Ernst & Young Scandinavian Tax Desk at the firm’s International Tax Department in New York. Ann-Christine led the Desk for three years and emerged as a leading international tax advisor. In 1993 Ann-Christine co-founded and launched Westerlund & Mousa (later Westmusa) inpartnership with her husband, acclaimed media executive M.E. Mousa. The new firm brought to life Mousa’s concept of “an international tax advisory that provides expert tax returns and accounting services to Nordic companies and individuals in the USA.” Over the ensuing 25 years under Ann-Christine’s leadership Westmusa rose to become a premier tax return preparation and advisory firm serving a “who’s who” of Nordic companies and individuals. 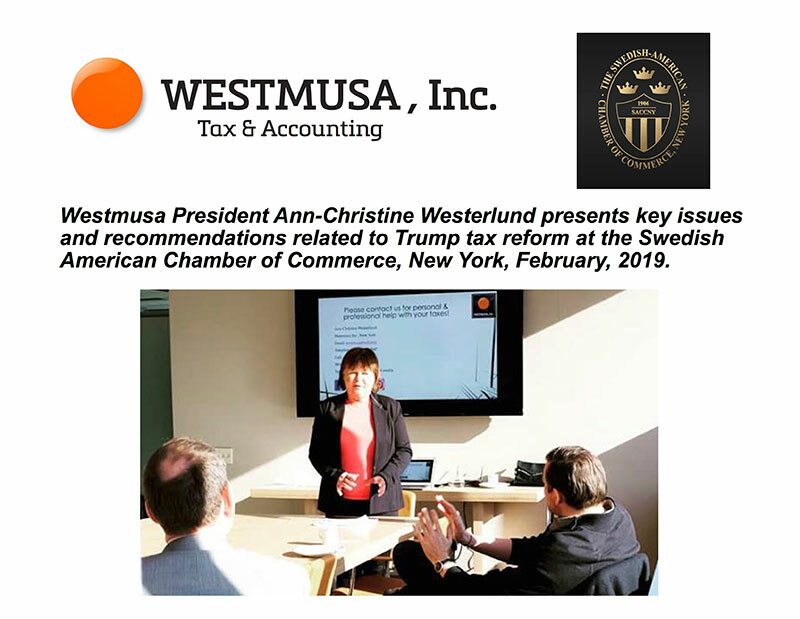 Ann-Christine’s deep understanding of both Nordic and US tax regulations and her fluency in English, Swedish and Finnish make her and the Westmusa staff uniquely qualified to prepare your US tax returns and advise you on US-Nordic tax-related questions. 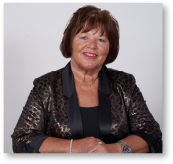 A leading light in the Nordic community in New York, Ann-Christine is an active member of leading Nordic-American professional organizations and the International Taxation Committee, New York State Society of CPAs. A lover of sport and the outdoors, Ann-Christine has completed numerous marathons and half-marathons, including the New York, Helsinki, Stockholm and Rotterdam marathons. Skill, energy, and a winning attitude. These are the qualities Victor Westerlund contributes as a member of elite SM-liiga handball team BK-46 … and they’re the same qualities he brings to the Westmusa team. Victor is fluent in English, Swedish and Finnish. He based in Raseborg, Finland, providing helpful Nordic presence, complemented by frequent visits to Westmusa’s New York City headquarters. Now in his fourth year with Westmusa, Victor works closely with Ann-Christine Westerlund to provide the expert, customized tax and accounting service that sets Westmusa apart. Victor is completing his B.S. degree in Finance and Financial Management Services at Arcada University of Applied Sciences. M.E. Mousa, Co-Founder, Westmusa, Inc.
That was the business concept M.E. Mousa conceived in the early 1990’s after an exemplary 28-year media career, including service as International Advertising & Media Director at Al-Ahram newspaper in Cairo and New York. 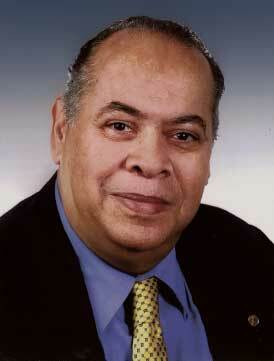 In 1993 Mousa convinced his wife, Ann-Christine Westerlund, a partner at Ernst & Young in Finland and the USA, to join forces and together launch Westerlund & Mousa, later incorporated as Westmusa, Inc.
Mousa handled marketing for the new organization, enabling Ann-Christine to focus almost exclusively on client service. Mousa also inspired Ann-Christine as she met and overcamethe challenges associated with starting a client service business in hyper-competitive New York City. 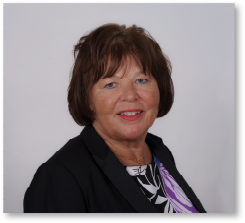 Over the years Ann-Christine has emerged as a leading international tax advisor and Westmusa’s client list has grown to include a “who’s who” of Nordic clients. Yet Mousa’s original business concept, vision and support remain at the center of it all. Mousa was particularly skilled in connecting people and business. In 1991 he was honored by the US Department of State for his success promoting US-Middle Eastern businesses. After retirement, Mousa became an accomplished nature photographer. His work has been exhibited at prestigious shows in New York, Finland, Aruba, and most recently at Miami Art Week and Art Expo New York. Mousa’s work also serves as the leitmotif for this website. Click here to view selected works from the M.E. Mousa gallery at Art upCLOSE. M. E. Mousa passed away April 7, 2017. Ann-Christine Westerlund (Anki), Founder of Westmusa, Inc. In the age of Trump, how are Swedish income and assets taxed in the USA? How will you be taxed in the U.S. if you move to Sweden? View selected works from the M.E. Mousa gallery on Art upCLOSE. Join our email list so we can notify you about important information and events. We will not share your information with third parties.